Everyone loves a hero. Stories about protagonists are a staple in our society. Whether they are real or fictional, every hero needs a villain. And every protagonist needs an antagonist. Rarely do we see stories where the antagonist is the main character in the literary sense. But often when the antagonist does become the focal point, their origin story will shed a light into what made them the villain they are. In the extremely tough to swallow The Erlkings, two of America’s greatest monsters, Eric Harris and Dylan Klebold, are given a massive spotlight into the lead up before the infamous massacre at Columbine High School. Using papers, essays, journals, and the like of the two notorious murderers, The Erlkings is a series of vignettes that lead up to the tragic April day in 1999. Written by Nathaniel Sam Shapiro, The Erlkings thrust Harris and Klebold front and center and attempt to reveal the truths to their actions. While The Erklings may seem like an original, it is not the first big budget Columbine inspired play. 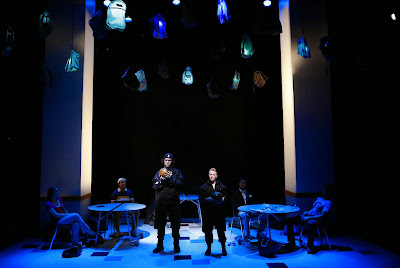 Shapiro used the same exact source material that also inspired the stronger columbinus, written by Stephen Karam and PJ Paparelli. With an already established piece, comparisons must be made, and unfortunately for Shapiro and The Erlkings team, Karem and Paparelli did a masterful job and did it better. Both scripts rely on similar source material and short scenes in a theatrical manner. Both scripts call upon props dropping from the sky that are integral to the world of the play. But both pieces though call upon a different set of emotions. columbinus tugs at your heart. The Erlkings may do nothing but make you angry. This is not the first time murderers have been given the theater treatment. In fact Stephen Sondheim wrote an entire musical about President killers. While Assassins was also a killer showcase, the approach was ridiculously different. Sondheim and book writer John Weidman theatricalize the individuals, with the great aid of music and character. Shapiro brings us the real deal. And layered in some uncomfortable laughs. Using any ounce of humor in an incredibly dark and harrowing time of our history was a poor decision. The moments felt forced and tasteless. Sure, heavy material should have moments of light but with this subject, it doesn't exist. Comparisons aside, the way Shapiro established his script, rather than allowing the characters to act and speak naturally, he forced them to establish the source where the following monologue was derived from almost as if to allow the audience to know these horrifying passages were not his words. Em Grosland and James Scully had an incredibly difficult task in giving life to Eric Harris and Dylan Klebold respectively. The emotional journeys both actors gave to their stage counterparts were present. Grosland and Scully tapped into their stage counterparts so well it was scary. Had they not been forced to establish every single monologue, you may have not been able to tell actor from character. The five person supporting company had very little to do but support and move furniture, but Matthew Bretschneider strayed from the pack and gave an incredible performance in his varied roles. Director Saheem Ali employed extraordinary stagecraft into this production. The Brechtian nature of his staging, with props and costumes and actors all present throughout, was an incredible device. The lighting design by Katy Atwell was stunning. The costumes by Lux Haac were fitting. The set by Doss Freel was simple, despite the seemingly borrowed dropping device. Despite all this, where Ali failed was separating reality from theatricality. Because Grosland and Scully portrayed their roles so well, you knew the endgame and hated them, garnering no potential empathy as characters. Going in, the audience knows the material is going to be dramatic, but Ali’s pre-show of lunch room bullying was too heavy. To the point where the audience was terrified to go about their own pre-show business. Shapiro in his author’s note makes it very clear that his intention is to inform and open our minds to understand Eric Harris and Dylan Klebold. Even in the piece, one of Eric’s notes says not to blame anyone but them, yet the question of the piece begs can we truly forgive them and every single person who did in fact miss the signs. Shapiro makes the case that their actions are in fact human. That may be true, regardless, our hearts may still feel otherwise. Fifteen years may still be too soon to humanize the duo. The Erlkings is nothing short of ambitious. Unfortunately, the approach is far too polarizing. Controversy may not always be the worst thing in the arts. It gets people talking. And every single audience member was talking when the house lights rose.